First Prize: Small Press Award, 1999. Children’s Book, age 4–8. The Wish Ring is a gentle, 130-year-old German fairy tale that shows how kindness and hard work triumph over craftiness and crime. Another version of The Little Engine That Could, the fortune of the book’s hungry, downtrodden heroes turns once they are convinced that their boulder-filled field can become rich farmland. Adults as well as children will be captivated by Thomas Sperling’s historically correct illustrations of old-fashioned farming. “[The Wish Ring is] the heartwarming tale of Hans and Lena, two poor farmers who come by a magic ring that has only one wish. Afraid to waste this shortcut to riches and happiness, the couple discovers that they do not need supernatural magic to make their dreams come true. 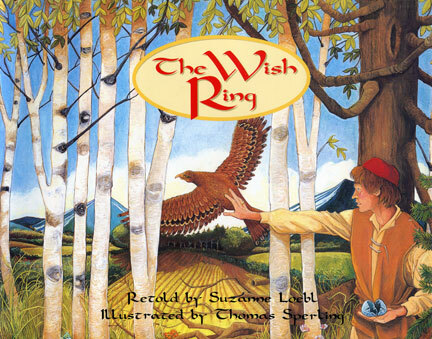 “Like the wish ring, the picture book has its own magic. The original tale was written by Richard Volksman-Leander, a Prussian army surgeon, who participated in the Franco Prussian War of 1870. Ms. Loebl read the story as a child in Germany. Its message stayed with her while her own world collapsed during the biggest war the world ever experienced. … a widely published author … she retold the beloved tale and dedicated it to her three grandchildren.